THHN is a thermoplastic high-heat-resistant, nylon-coated wire. It’s the designation for a specific insulation material, temperature rating, and condition of use for electrical wire and cable. Extremely popular as an inexpensive building wire, THHN wire serves its purpose admirably and, can be used for wiring machine tools, control circuits, and certain appliances. Nylon Jacket: Known in the field as the sacrificial layer, it is a first and short-lived line of defense. It’s also not flexible, which is typical of nylon-coated products and doesn't do the end user any favors when it comes to minimizing labor and downtime during installation. PVC Insulation: In chemical environments, the insulation leaks and leads to breakdown. What’s the fix for this? A marvelous molecular mass known as the fluoropolymer. To understand the fluoropolymer and its impact/benefits, it makes sense to first visit the root term, polymer. A polymer is a large molecule composed of many repeated subunits. It plays an essential and omnipresent role in everyday life. Polymers can be the very familiar synthetic plastics that are found in households (think polystyrene). They can also be natural biopolymers that are fundamental to biological structure and function (think DNA and proteins). Polymers by design have unique physical properties including toughness and elasticity. Fast forward to the fluoropolymer. Comprised mostly of strong fluorine and carbon bonds, it was discovered by accident in the 1930s as a result of other testing. What’s so exciting about this find? It so happens the fluoropolymer is characterized by high resistance to corrosion from most chemicals, better high-temperature stability than any other plastic, and for having a low coefficient of friction. It’s also the fluoropolymer at work in the coating on your household “nonstick” cookware! So what happens when you mix a marvel like the fluoropolymer with industrial wire and cable in hopes of saving customers from unnecessary repair/replacement plus labor and downtime? Meet Chem-Gard® . Why Chem-Gard Over THHN Wire? 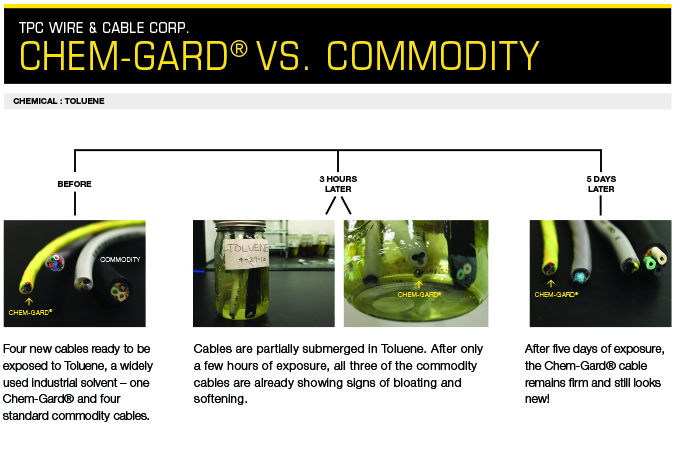 If you’re working with applications that are particularly harsh because the environment consists of humidity, heat, and chemicals, and if you have experience with the cesspool that is the inside of a conduit, consider Chem-Gard — TPC’s flagship series of cables for chemical resistance and extreme temperature. Unlike THHN building wire, Chem-Gard features a fluoropolymer jacket and insulation, allowing it to stand up to harsh chemicals, high heat, and even extreme cold. The temperature range goes as high as 200 degrees Celsius. The fluoropolymer jacket also provides excellent protection from abrasion and makes the cable easy to pull through conduit. In today’s industrial environments, being mindful of the water, oils, and other chemicals that come into contact with your cable can give you an advantage in choosing the right product with the longest survival. A cable’s jacket can swell, crack, or harden after exposure to chemicals and can even wick the fluids into the cable itself. Chem-Gard products are especially chemically resistant due to the fluoropolymer jacketing and insulation. Choosing the right cable for your environment reduces unplanned repair/replacement and therefore costs associated with parts, labor, and downtime. If you require a tough, yet flexible cable that withstands corrosive chemicals, abrasion, and high temperatures, consider Chem-Gard over THHN wire. TPC's Chem-Gard series offers an extensive line of shielded and unshielded cables with both single and multi-conductor configurations. Because of the unique properties in Chem-Gard materials, we recommend a shielded product for dynamic flexing applications. To request a sample and/or discuss your challenges with chemicals, abrasion, and heat, call 800-211-4520 or leave us a comment below.